When the Pinnacle Real Estate Group of Lake Tahoe was launched, a vision was the driving force. A vision that a team of individuals with proven integrity, honesty & professionalism could unite their unique skills toward the goal of earning the reputation as Lake Tahoe’s real estate brokerage with the highest levels of excellence and quality service. It was the founding belief that the same guidelines that bring success to businesses outside of real estate – market knowledge, creativity, global connections, progressive technology, and communication skills – would succeed in real estate, as well. Opening our doors at the same time the real estate market was beginning a downward cycle, presented unanticipated difficulties. Yet, these very difficulties were the catalyst that brought our team’s strengths to the forefront. We listened to clients and focused on how best to meet their needs. We invested heavily in providing our agents with education and tools to aid in their success despite the down market. And, we explored innovative marketing programs and strategies to help our clients get homes sold quickly. That vision has since become a reality. Today, the Pinnacle Real Estate Group of Lake Tahoe is among the leaders in the number of Lake Tahoe homes sold per agent, production levels and less time on the market. 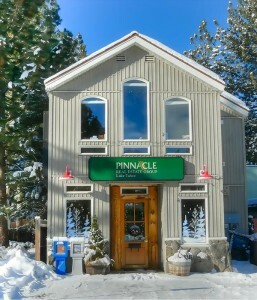 The Pinnacle Real Estate Group of Lake Tahoe, Inc. is a full-time, full-service Lake Tahoe real estate company. Our Tahoe company is a broker co-op comprised of well-respected and experienced professionals. Our agents are among Lake Tahoe’s top producers representing an established percentage of the area’s market share of closed sales throughout South Lake Tahoe. This success reflects on the quality, perseverance and innovation of our agents providing them the opportunity to remain leaders in the real estate industry. Previous to forming the Pinnacle Real Estate Group of Lake Tahoe, Inc. the Souers & Benedict teams, owners/founders, earned national levels of recognition for both production and quality of service with one of the country’s most recognized real estate franchises. Their extended networks are far reaching and long-lasting. Perhaps most importantly, the associates of the Pinnacle Real Estate Group of Lake Tahoe have earned numerous awards and recognition representing years of superior client satisfaction and sales performance. Previously known locally as the Mountain Spirit building, we inherited a “feel-good, high energy” building. Located right in the middle of South Lake Tahoe and parallel to Lake Tahoe Blvd., the Pinnacle Real Estate Group of Lake Tahoe, Inc. is within steps to the beaches of Lake Tahoe, 5 minutes to the slopes of Heavenly Mt. & just a hop to the stunning new redevelopment area. The benefits to you? – maximum exposure. Our family operated company has chosen the Golden Rule as our mission statement. The Pinnacle group’s achievements are attained through pure and simple, hard work. Each client is treated with the personal attention we would give to our own family members. Seven days a week, we focus on providing the best service possible. Whether you are buying, selling, or investing in real estate, you can be sure that a Pinnacle Real Estate professional is standing by and ready to assist you.